It's the unofficial beverage of Canada, found on brunch menus across the land. But I have a confession. I'm not a fan of the Caesar. If you're unfamiliar with this beverage, it's basically a Bloody Mary, but using clamato juice instead of tomato juice, and tends to have more spice — specifically horseradish. For decades, the reigning king of commercial clamato has been Mott's. Now, for Caesar lovers looking for an all-natural, MSG and corn syrup-free alternative, you have a great new option in Walter Caesar Mix. Launched in late 2013, this small-batch Canadian concoction is made "using vine-ripened tomatoes, grated horseradish, Worchestershire and hot sauce, select spices, and real clam juice from the North Atlantic." It's also bottled in glass, which not only keeps the flavour pure, but keeps the polyethylene terephthalate used in plastic bottles out of your brunchtime libation. Now, as I said, I'm not a Caesar drinker, but when I saw a few other bloggers using Walter to cook with, I thought, "Of course!". It's been used in cabbage rolls and meatloaf, so I had to fix up something new. 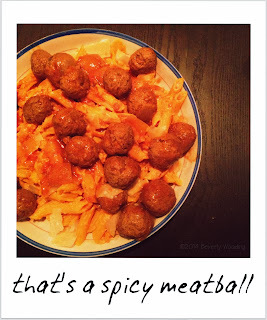 I settled on slow cooker meatballs, using the well-spiced mix, atop penne ala vodka using the mild mix. 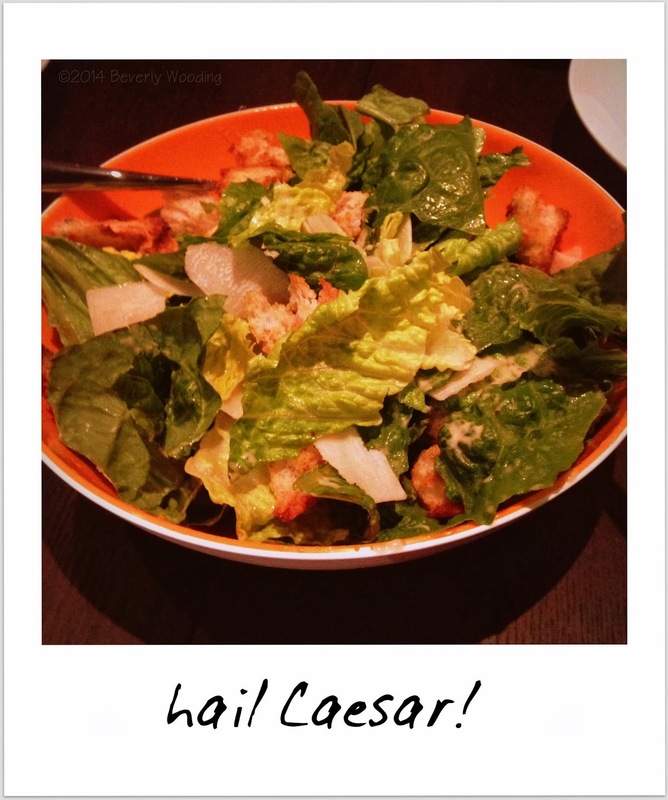 My friend Catherine contributed, what else, a Caesar salad to keep with the theme. Both my dishes were super easy, though I messed up a bit, adding too many breadcrumbs to the meatballs. They ended up a little dry, but that's an easy fix. I would also have added a tin of tomato paste to the meatball sauce for more thickness. Meatball boo-boo aside, the flavour in both dishes was fantastic. Full of rich, tomato-y sweetness with a hint of seafood freshness and really well balanced spices, withouth the need for salt or pepper. So, without further ado, here are the recipes, with improvements. Combine all ingredients in a large bowl and smush together with your hands until completely blended. Roll the meat mixture into smallish balls — about 1 ½ inches in diameter. Layer in your crock pot and cover with the remaining Caesar mix. Toss in the shallot halves. Cook on low for 6-8 hours. C'est tout! Cook penne according to directions on package. Drain and set aside. In a large skillet heat olive oil. Add garlic and cook for 30 seconds. Add vodka and cook until the flames dissipate. Add cream and bring to a boil. Reduce heat so that cream simmers. Stir until mixture has reduced in volume by half. Add Caesar mix. Add cooked pasta. Stir until coated and heated through. Serve with grated Parmesan cheese. Note: The product used in this post were provided courtesy of Walter. 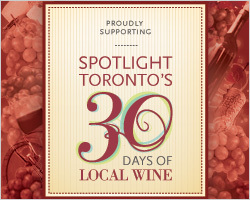 You can get your own at stores across Ontario and British Columbia, as well as Montrél. Visit Walter's site for a complete list of locations.